Dennis Kennedy and Tom Mighell discuss their book that talks about doing collaborations and why it’s necessary for lawyers, as well as tools attorneys can use to create efficient teamwork. Collaboration is becoming increasingly important within the legal field especially with emerging technology that makes it easier than ever. 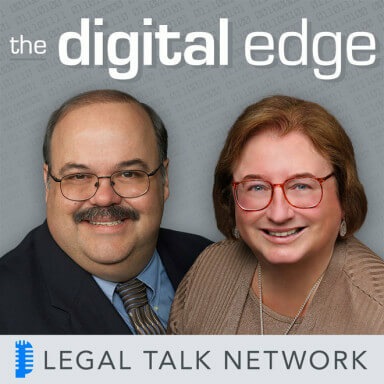 In this episode of The Digital Edge, hosts Sharon Nelson and Jim Calloway talk to Dennis Kennedy and Tom Mighell, authors of The Lawyer’s Guide to Collaboration Tools and Technologies: Smart Ways to Work Together, about collaboration, why it’s necessary for lawyers, and the tools attorneys need to make their teamwork efficient. They also discuss what has been driving lawyers more and more towards collaboration techniques and how collaboration can assist with case management. Tom Mighell is a published author, noted legal technologist, and runs his own blog, Inter Alia. He is currently senior consultant for Contoural, Inc.
Dennis Kennedy is an award-winning leader in applying the internet and technology to law practice. Sharon D. Nelson: Welcome to the 125th edition of The Digital Edge: Lawyers and Technology. We are glad to have you with us. I am Sharon Nelson, President of Sensei Enterprises, an information technology, cybersecurity and digital forensics firm in Fairfax, Virginia. Jim Calloway: And I am Jim Calloway, Director of The Oklahoma Bar Association’s Management Assistance Program. Today, our topic is “Collaboration Tools and Techniques, Smart Ways to Work Together”. Sharon D. Nelson: Before we get started we’d like to thank our sponsors. Answer1 is a leading virtual receptionist and answering services provider for lawyers. You can find out more by giving them a call at 800 Answer 1 or online at HYPERLINK “http://www.answer1.com” answer1.com. Jim Calloway: Thanks to Scorpion. Scorpion sets the standard for law firm online marketing with proven campaign strategies to get attorneys better cases from the Internet. Partner with Scorpion to get an award-winning website, ROI positive marketing programs today. Visit HYPERLINK “http://www.scorpionlegal.com/podcast”scorpionlegal.com/podcast. Thanks to ServeNow, a network of trusted prescreened process servers. Work with the most professional process servers who have experience with high-volume serves, embrace technology, and understand the litigation process. Visit HYPERLINK “http://www.serve-now.com” serve-now.com to learn more. We are very pleased to have as our guest, our good friends Tom Mighell and Dennis Kennedy, the authors of ‘The Lawyer’s Guide to Collaboration Tools and Technologies: Smart Ways to Work Together’, Second Edition. Tom Mighell is the Vice President of Service Delivery at Contoural, Inc. where he helps organizations develop information governance, litigation readiness and privacy programs. Tom is the co-host of The Kennedy-Mighell Report and the co-author of the book ‘The Lawyer’s Guide to Collaboration Tools and Technologies: Smart Ways to Work Together’, Second Edition. Tom served as Chair of the ABA’s Law Practice Division in 2011 to 2012. Dennis Kennedy is an Information Technology lawyer and Legal Technology author who is well-known for his role in promoting the use of technology in the practice of law. A professional speaker and an award-winning author with hundreds of publications to his credit, Dennis wrote the legal technology column for The ABA Journal for many years, has co-authored several books and contributed others, and also co-hosts the long running podcast The Kennedy-Mighell Report on the Legal Talk Network. Dennis recently retired as Senior Counsel for Digital Payments and Labs at MasterCard. Thanks for joining us today, Tom and Dennis. Tom Mighell: Well, thanks for having us, Jim and Sharon. We always love to be on your podcast. Dennis Kennedy: It is always great to be on the Digital Edge. Sharon D. Nelson: Well, thank you both very much. We sure appreciate your being here. And Tom, let me start with you. Your first collaboration book was a pioneering book, it was so well reviewed and well received. What was the impetus for doing a second edition? Tom Mighell: Well, there are couple of reasons why we decided to do the second edition. I guess the first one is, 10 years is a long time, that the first edition came out in 2008. We couldn’t believe when Dennis and I finally sat down and decided it was time for a new edition, we couldn’t believe it had been that long. But what I think more interesting is, is that, when we did the first edition although collaboration tools have been around for awhile, even at that point, I would make the argument that our book was kind of ahead of its time, at least for lawyers anyway, and we are finding now that the need and desire for collaboration tools has been steadily increasing. Lawyers are finally coming around to it, if we understand the idea of lawyers as later adopters, they are finally catching up to that curve that we wrote about 10 years ago, and as I think we will discuss maybe a little further on, there are lot of things that have changed in the collaboration space in last 10 years, lots of new tools, lots of old tools that are dead and buried. I mean, it’s really changed a lot in the last 10 years. Jim Calloway: Well, after publication of this book noted futurist Jordan Furlong wrote quite a tweet storm praising your first book is pioneering, and we agree, what has been driving lawyers toward collaboration since that first book, Dennis? Dennis Kennedy: Well, we are really grateful to join of course and he was especially excited about the second edition too, but I think there’s a couple things as Tom said, to have been driving lawyers toward collaboration, and so, one would of course be the cloud. So, as the rest of the world has gone to cloud-based tools for everything from e-mail to social media, to document storage, to everything else, lawyers have gradually come along so that the movement from software installed on an individual’s machine to services that you use over the Internet through a browser on what’s known as the cloud, was obviously a big driver. And then I think probably the biggest change when we were writing the book is that I don’t think the iPhone even existed at the time of the first book, so the whole movement of smartphones and apps I think just has become huge. And so people are now starting to think I can work from anywhere, I can do anything at any time on my phone and if I am doing that then that allows me to work with different people in different ways. And then I think there is a more geographic approach that can be people working at home, it can be people working in remote offices, it could be a lot of things. So, the collaboration using the Internet has become important, I would say those are the big drivers, really to me are cloud, mobile apps and then geographic differences. Sharon D. Nelson: Well, Tom, you talk in the book about having a collaboration strategy and that word “strategy” really caught my attention. Why is it necessary to have a strategy? Tom Mighell: If you don’t have a plan for how you and your collaborators are going to work together, the chances for success are just not going to be there. It’s not just as simple as calling up your client and saying, hey, I just learned about this great tool, it’s called Slack, we are going to use it to collaborate with clients, can you download it today and let’s start using it, I will send you a message tonight and let’s get started. You have got to really think about it thoughtfully ahead of time. You have got to understand how do I want to collaborate with my clients, excuse me, it’s really who do I want to collaborate with, it’s not just clients, I assume clients but it could be just people in your office, it could be co-counsel, it could be our friends at the ABA that we want to collaborate with. It’s figuring out who do I want to collaborate with, why do I want to collaborate with, and what do I want to do as part of that collaboration, what’s the purpose of us getting together and working together using technology? One of the best ways, one of the best tools to do this based on what we want to do sometimes the tools you have are the tools you need. Sometimes you need to look at other things and there are tools that are better than others. And then I think that — and I am probably going to beat this drum quite a bit during a podcast is, it’s not enough again to say, just go ahead and learn it, you’ve got to be able to whoever your collaborators are, you’ve got to be able to teach them, you’ve got to be able to provide them with information to say here, here’s a new tool we are going to use, here are some videos, here’s some simple ways to look at it. Because I will tell you right now I am working on with a volunteer group, working on a collaboration tool, and I just rolled it out to them. I did the exact way that I don’t recommend in the book and I have got lots of lawyers who are well-meaning but not very technology-friendly, who are all using it in different ways, and it really makes a difference. So, it really should be a thoughtful process that you figure out because if you don’t have that thoughtful process then whatever collaboration effort you come up with, it’s just not going to work out. Jim Calloway: Dennis, there seemed to be distinctions between the types of collaboration, what are the distinctions you draw between collaborating within your own firm and collaborating with others outside of your firm? Dennis Kennedy: In many ways I think this is a key point of the book. You need to understand when you want to have an open system and when you want to have a close system, when you want to allow editing, when you don’t want to allow editing, when you want to allow sharing of metadata, for example, and when you don’t; and so, it’s like when are we on the same team, when are we on separate teams? And so, I think as you think that’s ruined and so in one place or in the one size of typically internally, but it can be different if you are working with co-counsel or clients, it is that you would say what side I am revising, I am working on something, I am editing and then the tools need to allow that. So, things like tracking, EXIF metadata, those sorts of things and it’s open, so you allow changes to documents and then you have some control over who can go into it. On the other side when you are working with the other side, let’s call it, I really think in terms of publishing. So what you send out, is locked down. So you might allow people to make track changes, but not to do anything to really change the underlying document in a way that you don’t know that. You might use PDFs. You are very concerned about metadata, as we know, and I know, Sharon, you and Jim have talked many times on this podcast about people accidentally disclosing information, the metadata about documents. So, once you send it out to the other side to work on things, you tend to lock things down more, so that openness versus closeness is how I do that. And if you get that basic understanding, I think you really go a long way towards choosing the right collaboration tools. Jim Calloway: Looking for a process server you can trust, Serve-Now.com is a nationwide network of local prescreened process servers. ServeNow works with the most professional process servers in the country. Connect your firm with process servers who embrace technology, have experience with high volume serves, and understand the litigation process and the rules of properly effectuating service. Find a prescreened process server today. Visit HYPERLINK “http://www.Serve-Now.com” Serve-Now.com. Sharon D. Nelson: Welcome back to The Digital Edge on the Legal Talk Network. Today our subject is “Collaboration Tools and Technologies: Smart Ways to Work Together.” And our guests are Tom Mighell and Dennis Kennedy, the authors of the Second Edition of ‘The Lawyer’s Guide to Collaboration Tools and Technologies: Smart Ways to Work Together’. I think we have managed to put the point home there, don’t you, Tom? Tom Mighell: I think so. Sharon D. Nelson: Tell me, how does collaboration assist with case management, which is a chronic thing that seems to plague lawyers? Tom Mighell: Well, I think case management is a collaboration effort in itself. I mean, without technology — even without technology, if you are going to manage the cases that you work on, unless you are a solo lawyer working on a case, it’s a collaborative effort, no matter what. And frankly, even if you are a litigator and you are working on a case, you are still going to be collaborating with people on the other side of the fence. You are going to be collaborating with your expert, with your client, with others. So, I think that frankly case management is a great example of how people can collaborate both inside and outside the office, and that could include your paralegal, your assistant. You could include a couple of associates. Maybe you have a corporate client and they have in-house counsel. Maybe you have got a lot of witnesses that are working with your client. Maybe there’s an expert witness that you are going to want to involve in the case. You are going to want to find a way for all of them to work together. And the question really becomes, how do they do that? How do we all find the right way for everybody to work together, either as one or in a way that makes sense so that it’s all there? And usually, ideally anyway, it makes sense to have some form of centralized repository, a case management tool internally that can also share documents with others outside the law firm, where you can communicate with each other, where you can review documents, where you can make plans and look at schedules and strategies. And it’s also important though, as Dennis mentioned, that you are going to want to be able to keep good access controls, because not everybody on your team is always going to be able to — or you don’t want them to see everything. For example, you may want your expert witness to review documents that the other side produces, but you don’t want the expert to see your trial strategy documents, so being able to configure a case management tool to allow the right level of access, depending on that group, that’s going to be one of your more important considerations. Again, tying back to that question you asked me before, I think that case management being ideally suited for collaboration really still has to be carefully thought through, whom am I collaborating with, how am I going to do it, what tools do I want to use and what kind of controls do I need to put around that collaboration? Jim Calloway: We think of this new collaboration tools as online tools, but how can you collaborate both online and offline, Dennis? Dennis Kennedy: Well, actually it’s interesting to me; I think it’s getting harder to collaborate offline. So there are face-to-face meetings, but sometimes you think these days that if you are collaborating with somebody offline, you are really trying to hide something, so it’s like a really interesting difference in mindset. So, I think what you are looking to do is to move what you are doing offline, sort of in the real-world onto the online collaboration tools. So the face-to-face meeting might be replaced with videoconferencing, things like that. And so that notion of bringing what you do in the real-world into the Internet or the cloud platforms becomes really important and then it becomes a case, as it is in the real-world of what’s the right tool, at the right time, in the right place, for the right people? So sometimes you can’t beat face-to-face, in-person meetings and a lot of other things can be handled by all sorts of different things. And I would say probably the surprise to us as we look to collaboration tools is in an unexpected way how important texting and instant messaging has become to lawyers. Sharon D. Nelson: Sad that. But okay, I accept your judgment there, Dennis. Okay, Tom, so what our listeners like, just like your podcast listeners, is they love practical things that they can use. So, can you name for us some of your favorite collaboration tools so that people might want to take a look maybe at some that you throw out there? Tom Mighell: Well, yes, although I am going to spend most of my time talking about one, because it really has — it really has become my favorite collaboration tool over the past couple of months, and that is Microsoft Teams. It is part of Office 365, so if you have an Office 365 account, you automatically have Teams. There is a lot of — parts of the Office 365 suite that people don’t realize they actually have beyond Word, Excel and PowerPoint, there are a lot of great tools, and Teams is a collaboration tool that is just fantastic. It’s Microsoft’s competitor to Slack, which I think some of the listeners on the podcast may be familiar with. At its heart, Teams is basically a messaging tool. So the people on a team, let’s say, let’s use litigation again, people on a case can talk with each other. You can set up separate channels on different topics and share files with each other. What’s nice about Teams is that they are trying to design it so that you can basically do everything you want to do with your team in that app, that tool itself. I can start up a meeting right within the app. I can share screens and show my document. I can see each other on video. We can co-author on documents at the same time. And since it’s all a Microsoft tool, it’s completely integrated with Microsoft Office, so it’s really simple to share Word, Excel, PowerPoint files with everyone. If you are using the — it kind of goes in line with Teams, if you are using Office 365 and you store your records, either within OneDrive or within SharePoint, there’s an auto-save feature and a co-authoring feature that make it really simple to just say here, let’s work on a document together and you can share the same copy of that document, very similar to a Google Doc, and much easier, because while I like Google Docs, but face it, I think most lawyers live in the Microsoft world, it makes it really, really simple. And I think that having a tool like Teams that brings all of that together is really powerful, because it allows you to collaborate in any way that you want. I guess the only other thing that I would say, my other favorite collaboration tools are Meeting Schedulers; very simple, very easy, the tools that can basically take 10 people’s individual availability and boil it down to one time, so that you avoid having so many emails go back and forth where people say they can’t make meetings, they can’t go to things. I love those tools because I think they completely shortcut that process. I think they are one of the quintessential collaboration tools. Sharon D. Nelson: Do you have a favorite? Tom Mighell: Well, my favorite actually, not to beat on the Office 365 drum, my favorite is FindTime. FindTime is an Office 365 add-in to Outlook. It’s free to use. It plugs into your Outlook, into your Exchange account, and so it can see your calendar and it will automatically schedule meetings for you. It’s great. If you don’t want to use that, really I would go simple, Doodle. Doodle is a really simple tool. It’s elegant in its simplicity, but it’s not really complicated to use. So, either one of those. Those are the two that I use these days. Sharon D. Nelson: Okay, thank you. Jim Calloway: Tom, I have to tell you, I just did my first joint collaboration on a document with 365, because I am a rather new user, and my first thought was to look up how old Google Docs were, which is over a decade old. Tom Mighell: No kidding. It’s over that long. People have been using Google Docs to collaborate since before we wrote the First Edition. Jim Calloway: Dennis, what are some of the collaboration platforms you would recommend? Dennis Kennedy: Well, I too love those schedulers and it’s a great example of a tool that takes something that’s a real pain for you and just makes things easier. So one of the things we question is, is sometimes people, lawyers especially, are looking for that sort of platform that will handle everything, and in a certain sense the best collaboration tool really is the one that’s right in front of you that you are actually using. And the one that the people you are collaborating with use. Like I know a lot of lawyers who say, I hate Track Changes, I am never going to use Track Changes, but if the other party sends you a document marked up in Track Changes, you are going to be using Track Changes. So there is a notion of co-evolution and co-creation that comes along in collaboration. And so I think you can kind of overstate the platforms and the importance of a full-blooded platform. So I always like to say what are you hiring the collaboration tool to do, and so sometimes that will be a platform, but typically the platform is going to work best internally, because you have a lot more control of it. But as Tom says, he likes Microsoft Teams; I really like using Microsoft Skype for business. I think it gave you a lot of collaboration tools; Slack I like; SharePoint done right can be great. So there are a lot of the bigger tools, but I think it’s that, what do I agree on with the people I am working with that will help me the most, and that’s to go back to the earlier strategy question, if you are talking to clients or especially your co-counsel and you are able to figure out what it is that needs to be accomplished in collaboration and then offer the tool, suggest that tool, it gives you a lot more control over what’s going on in the collaboration and that I think is one of the real benefits of learning a lot and understanding the tools that are out there. Jim Calloway: Before we move on to our last segment, let’s take a quick commercial break. Sharon D. Nelson: Imagine what you could do with an extra 8 hours per week. That’s how much time legal professionals save with Clio, the world’s leading practice management software. With intuitive time tracking, billing and matter management, Clio streamlines everything you do to run your practice, from intake to invoice. Try Clio for free and get a 10% discount for your first six months when you sign up with the code TDE10. Of course you can find Clio at HYPERLINK “http://www.clio.com” clio.com. Sharon D. Nelson: Welcome back to The Digital Edge on the Legal Talk Network. Today our subject is “Collaboration Tools and Technologies: Smart Ways to Work Together.” And our guests are Tom Mighell and Dennis Kennedy and they wrote the book. So, Tom, are there any favorite collaboration tips you would like to share with us? Tom Mighell: Sure. I have two quick tips and to follow on with what Dennis was saying, I find that one of the best tips is rather than going out and finding new technology, take a look at the tools you already have and not because other people are using them, but because they may have collaboration features that are new or at least new to you. There may be items in there that you didn’t know because you weren’t using as much of that application as you could. I think it’s always easiest to start with something that’s familiar to you than with something that’s new and foreign. So, first, take a look and see, applications are adding collaboration tools all the time, take a look at what they have and see if there is something you already are using. Second, I am going to come back, again, I told you I would beat this drum, I will beat it one more time, I can’t stress enough how important training is before you start working on a collaboration tool. If any of the team doesn’t really know how to use the tool, it will make, one, a miserable experience for them and turn them off collaborating; and two, it will be a pretty miserable experience for you and the rest of the team as well. It’s so important to go find a YouTube video, go find a guide from the service that provides the tool, go find something that can help give a background on how to use the tool and I think it will make it a much more pleasant process. Jim Calloway: Dennis, this is a pretty big statement, why do you call collaboration the future of law practice? Dennis Kennedy: Well, first of all, Jim, it’s not just me, and I would actually say that collaboration has been the past, the present, and the future of law practice, because what happens is we work together all the time. There is that myth of the solo lawyer in battle for justice, and the fact is that there’s all kinds of people working with them and against them and there is a court system and all these things going on. So once you sort of map out everybody you are working with, there is this collaboration that’s going on. So, a good friend of ours was talking about when he first heard the idea of the book 10 years ago and he just thought it was a crazy idea, it made no sense to him. He didn’t really understand what we meant and what the purpose of the book was and he says — he told me, he goes, I have never been more wrong about anything in my life. He goes this is such an important topic. And so I think there is that. We are always going to work together. We are going to do that more often. I recognize that my past role as I work with people all around the world, different time zones, all these different things happening, and we just see more and more of it as we become more of a cloud and app-based world. So, I mean the simple point I would say is working together is the only way we are going to survive as a profession. Sharon D. Nelson: Wow, that really sums it up in a very nice way. Thank you. Dennis and Tom, it was great to have you with us. Your expertise is so outstanding in this area and you have gone from being early pioneers to now being very savvy lookers into the future, and I really think that your book is wonderful and people really need to read it. It is the past, the present and the future of law practice; I think you said that very well. So, thank you both so much for being with us today. Tom Mighell: Thanks so much for having us Sharon and Jim. We love being on the podcast, have us back any time. Dennis Kennedy: And keep things strong at The Digital Edge. Sharon D. Nelson: We will do that. And that does it for this edition of The Digital Edge: Lawyers and Technology. And remember, you can subscribe to all of the editions of this podcast at HYPERLINK “http://www.legaltalknetwork.com/”legaltalknetwork.com or on Apple Podcasts. And if you enjoyed our podcast, please rate us in Apple Podcasts.